Talking About Racism And Racist Words Now Deemed Racist. “Well, in all my years I ain’t never heard, seen nor smelled an issue that was so dangerous it couldn’t be talked about. Hell yeah! I’m for debating anything.” – Stephen Hopkins, Rhode Island Delegate, from the movie 1776. There. We said it. It is forever locked into the annals of the internet and this blog for all time – never to be erased or lost. Somewhere, someone will have a record of the day the word appeared on this blog. That being said, we find the word offensive. 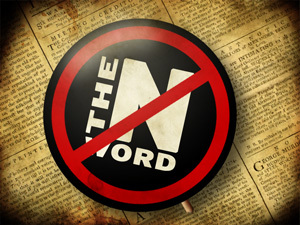 In today’s world and modern landscape, there is no need or purpose behind anyone using the “n-word” in public or polite conversation when directed at or describing another person. While we have been a consistent supporter of the First Amendment, the purpose of the First Amendment is to encourage debate and discussion. When used as an invective, the “n-word” has the effect of shutting down conversations. Points of view are no longer exchanged. While a person has a right to use the word, in most cases we believe they should not. One of those cases when the use of the word is acceptable is when it is used in a discussion of the offense it causes, the perception it has, or the stifling of debate. The only way to discuss how the word does these things is to use the actual word, as we are doing here. We used the word here because we are talking about the word itself and not directing it at anyone. Which brings us to teacher Lincoln Brown of Chicago. Brown teaches at the Murray Language Academy located on the south side of Chicago. His 5th and 6th grade writing and social studies students are mostly black children. We would bet that Brown had no idea when he went to work one fateful day in October there would be an incident in his class ending up being his being suspended and his reputation impugned, resulting in him filing a lawsuit against the City of Chicago. The incident arose after his sixth-grade pupils – aged between 11 and 12 – were left “unsettled and arguing” over a note that one of them had passed around class, containing lyrics to a rap song that included the racially offensive term. Mr Brown consequently started with them “a discussion about how upsetting such language can be, attempted to give his own denunciation of the use of such language and discussed how even such books as Huckleberry Finn were being criticized for the use of the N-word,” the lawsuit states. As the discussion continued, the principal of the school came into the room. Brown’s subsequent appeal to the Chicago Public Schools Board of Education was denied. As he started serving his suspension, Brown filed his lawsuit seeking to have his suspension overturned, back pay, and his record expunged. Did he use the n-word referring to anyone in the class? Did he use the words referring to a group of people? Just who did he abuse? If we are going to try and rid the world of racism and racist terms, how can we do that if we cannot talk about terms which are racist? That’s why if Lincoln Brown, a white teacher at Murray Language Academy who has filed suit against Chicago Public Schools, really wanted to have a healthy discussion about racism, he shouldn’t have used the slur in his majority black sixth-grade class. The word sounds ugly enough when black people say it, but it is especially demeaning when it slips through white lips. Still, Brown overstepped his boundaries. The fact that Brown grew up in an integrated neighborhood, was among the few whites who attended Kenwood High School; that he taught black children in a school that served the Robert Taylor Homes; that his father was the former dean of Rockefeller Chapel at University of Chicago and a supporter of the civil rights movement, doesn’t exempt him from the unwritten rule when it comes to the n-word. Most black people are offended when white people say n—– and it really doesn’t matter that Brown was trying to make a point. racism: a policy, system of government, etc., based upon or fostering such a doctrine; discrimination. In Mitchell’s mind, and apparently in the mind of the school and the school district, Brown being white means he cannot use the “n-word” in any context – even one that is a condemnation of the word and of racism. By definition, Brown’s treatment and suspension being based on his being white is racist. There is no other reasonable or rational conclusion that can be drawn. Lincoln Brown thought he was teaching his students the evils of racism and racist words. Instead, they got a better, more evil lesson when it was Brown who became the object of racists within the school system. To all the racist sphincter muscles who are coming here to display your ignorance and hatred for yourself and others, we are not going to allow you to advertise your stupidity. Take it elsewhere where people use mono-syllabic words, grunts and cannot yet walk erect.